There are NO short-cuts to creating true, rustic artisan bread. Naturally leavened, handmade bread is anchored in tradition, using only the simplest of ingredients: flour, water, and an agent of fermentation. No two naturally leavened loaves are exactly the same. As the founder of the nation’s number-one artisan bread company, La Brea Bakery, Nancy Silverton believes "A beautiful loaf, burnished on the outside, has a solid but not impenetrable crust, subtly blistered with tiny fermentation bubbles that say, this is a loaf of integrity, a loaf made with care and time." Over the centuries, bread has taken on many incarnations, meanings, and recipes. But it is real artisan bread that brings us a gourmet experience that fills both our hearts and stomachs creating a symphony for our taste buds. It is the absence of complexity, the unassuming greatness in each crusty loaf that gives our meals flavor, substance, and integrity. Artisan bread can be described as bread you want to eat. It is the bread that should be enjoyed all on its own. Butter or anything else would just get in the way. With each bite you taste the work that went into making the bread. 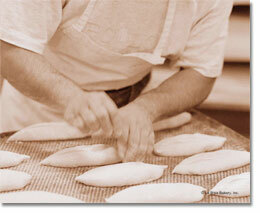 You realize that each loaf is enveloped in pride and workmanship. The proper way to enjoy artisan bread is to tear into it by hand, detecting that each delicious piece reveals its own unique attributes. The perfect loaf contains a texture that is elastic but not rubbery. The interior of the bread or crumb should be porous, almost sponge-like. You don’t want your bread to be tight, almost constricted, held together with an abundance of preservatives. An artisan bread’s interior should neither contain empty holes nor gaping air pockets. Rather, the interior of each bubble is laced with a network of strands. The crust, one of the first things you’ll notice, has more than the bare eye can see; there are caramelized layers of crunch in this crust. 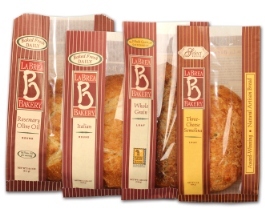 When it comes to artisan bread, the leader is La Brea Bakery, a hallmark at Harris Teeter’s Fresh Foods Market. By maintaining relentless commitment to Founder, Nancy Silverton’s original bread making practices and principals, La Brea Bakery changes the way people eat bread. Using flour, water, and wild yeast from the skin of organic grapes, Nancy’s living, breathing masterpiece starter is the signature ingredient in every single La Brea Bakery loaf today. The beautiful, one-of-a-kind breads that Nancy Silverton first started selling in 1989 out of a small Los Angeles bakery are the same virtuous all-natural breads you’ll find at Harris Teeter.